This page is for the original game. For the reboot, see XCOM: Enemy Unknown. Use OpenXcom for many new features, which is also highly moddable. Also released as UFO: Enemy Unknown and X-COM: Enemy Unknown. UFOpaedia - Wiki for the game. StrategyCore - The largest and oldest community for the game. xcomufo.com - Fan site with good FAQ and downloads. Use OpenXcom or DOSBox. Use UFO 1.4 to remove code prompts. 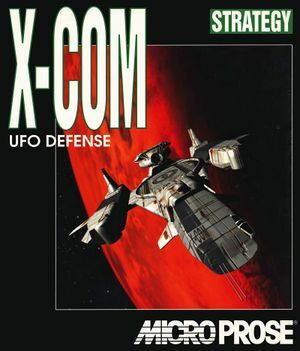 The X-COM: Complete Pack includes: X-COM: Apocalypse, X-COM: Enforcer, X-COM: Interceptor, X-COM: Terror From the Deep, X-COM: UFO Defense. The Collectors Edition ("Gold") is Windows native and, thus, wont run in DOS. It also is fully patched to 1.4 and has the difficulty bug fixed. The following tweaks are only available by using OpenXcom. An open-source, multi platform remake with various improvements. Unlimited save games support, along with native widescreen support and proper audio formats. 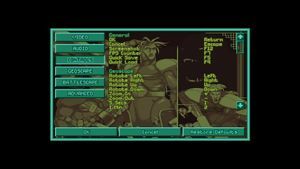 DOSBox no longer required, simply copy the new OpenXcom files where the main executable is located or use the provided installer. Go to the Options menu and then go to Advanced. UFO 1.4 updates the game to the latest version and removes the copy protection. Digital versions come pre-updated making this unnecessary on them. AI Patch unofficial patch that fixes several bugs in the enemy AI making them more effective. Warning to new players: makes the game more difficult. If you're on CE and using UFO Extender then this fix is unnecessary as it already includes one of its own. Polar Terrain Footstep Fix reintroduces the snow footstep sound on the polar terrain that was broken in patch 1.4; works on CE and somewhat untested on DOS. UFO Extender is CE version only. XcomUtil however works on both versions. If you only have the DOS version you can replace some of UFO Extender's functionality with BaseFixer: info on getting Python working in DOSBox is available here and a modified linker for XcomUtil 9.7+ integration can be found here. The UFO Extender program runs on the Windows version, providing a mouse-resizable window, a smoother-running, more responsive screen than DOSBox, and a host of fixes for various bugs or exploits in the game.. It also supports the use of higher-quality .mp3 music from the PlayStation release, and keyboard shortcuts. XcomUtil provides bug fixes, including for the disjointed-base bug, and additional ease-of-use features like the automatic re-equipping of soldiers before a mission and appending rank and stat info to soldier names. Both also offer many gameplay modifications such as enhanced weaponry, different starting-base layouts, and randomized terrain and UFO layouts. These are all optional and turned off by default. The programs are confirmed to run on Windows 7 as well as older operating systems, and with the Steam release. Install X-COM. If installing from CD, make sure it is a full installation. Download the UFO Extender loader "UFOLoader.zip", available at this Ufopaedia page, and extract it directly to the folder "XCOM", which is inside the base installation folder (e.g. "Xcom UFO Defense") in distributions with DOSBox. In the "XCOM" folder open UFOExtender.ini, find "D3D=0" and change it to "D3D=1" and change the value of "D3D Windowed" from 0 to 1. Save and close the modified .ini file. On Windows 7 and Vista, you'll only be able to run this mod combo in a window. It will launch work once in fullscreen, and not again subsequently (The window can be maximized though). If you do not wish to install XcomUtil as well, stop here, and you may run the game by launching "UFOLoader.exe" in the "XCOM" folder. Download the XcomUtil install file, currently "XcomUtil 9.7 Beta-442.exe", available at the downloads page at Bladefirelight.com. Run this file, again directly selecting the "XCOM" folder as the install location. If unavailable, use this .zip file for build 442, extract it into the XCOM folder, and then run XcuSetup.bat. XcomUtil setup should now be running in a cmd.exe window. If the cmd.exe screen appears blank, right-click on its title bar and select Properties. Under the Colors tab set "Screen Text" to a contrasting color from "Screen Background". When asked if you wish to configure XcomUtil now, enter "yes" and allow the program to run. XcomUtil setup may also ask Steam users if they wish to use XcomUtil when X-COM is launched from Steam. However, launching from within Steam will still launch DOSBox instead of the UFO Extender launcher, so select "no". You cannot launch with UFO Extender from Steam's menu. On the screen that says "Windows 7/Vista has Issues displaying DOS/Win. On startup you get a blank screen..." enter "no" to decline installing the patch suggested. Enter "yes" when asked if you wish to enable the use of UFO Extender when you launch the game. Continue answering the rest of the prompts with the options you prefer. If you do not wish to change gameplay, you can still enable the re-equipping of soldiers before each battle with their last set of items, and the automatic addition of useful information to soldier name strings after battles. Info on all the options can be found in the "XcomUtil.txt" file in the "XComUtil" folder. If you want to change these options, run setup again by launching "XcuSetup.bat" in the "XCOM" folder. You can also do this after starting a game. You may now launch the game by running "RunXCom.bat" (not "XCOM.bat") in the "XCOM" folder. If you are running Steam do not launch X-COM directly from its menu. Do not run the file "xcomutil.exe" to launch the game. It will not work outside DOS or DOSBox. 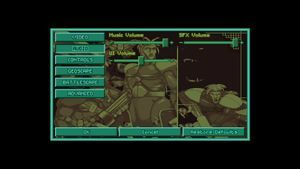 Xcomutil.exe simply provides a launch menu, with options for running the Xcomutil setup and the X-COM sound programs. Set additional UFO Extender options as you see fit by altering UFOextender.ini with Notepad. Information can be found here. In the provided download, all options are off by default, including enhancements that do not affect gameplay. You may enable Geoscape and Battlescape keyboard shortcuts and the stat display on the equip screen by setting the appropriate "Apply" values from 0 to 1, and set the keyboard shortcuts. DOS/32A is a more advanced extender and open source replacement to DOS4GW. It can improve both performance and stability of X-COM. It is recommended to turn off the extender's warning messages with its included ss.exe as they can be rather annoying and show up often when transitioning from geoscape to tactical mode. UFOPedia has an excellent article on this here. OpenXcom stores data in %USERPROFILE%\Documents\OpenXcom\ on Windows and $XDG_DATA_HOME/openxcom/data on Linux. missdat\ folder stores temporary data related to current active save game. Use OpenXcom. Click on the resolution box to input the resolution. Toggle with Alt+↵ Enter when using DOSBox. Hackable on CE with UFO Extender. Native with OpenXcom. Use OpenXcom. 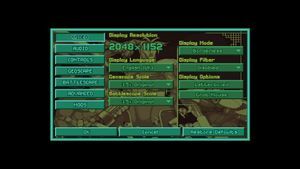 A frame rate cap can be set in the Advanced menu. Every key is by default already mapped when using OpenXcom. Use OpenXcom. Values can be set through the Scroll Speed option. OpenXcom also implements mouse wheel support. In the Advanced menu, under Geoscape. Use keyboard plus and minus (+ and -) to adjust music volume in DOS version. The original release only shipped with the English language. A patch to add US style spelling (verses UK) is available here. Use the Italian Language patch. Replaces French. Use the Spanish Translation patch. Hotseat. Requires XcomUtil; a tutorial explaining the process can be found here. A batch to simplify the process can also be found here (direct link). Use the above method, but also requires passing save files around between computers (physical media or email, ect). Alternatively use the UFO 2000 Mod (Windows only). Almost every single major bug has been fixed in OpenXcom. The original DOS version of the game has a bug which would run the game at the Beginner difficulty regardless of what the player actually selected. This bug went undetected until the Collector's Edition was released. The complaints regarding the game being too easy even at the highest difficulty setting led to the sequel's difficulty being scaled up so much that it's easiest difficulty was harder than the intended hardest difficulty for this game. If using the DOS version, XcomUtil also patches this bug. Apparently certain 1.4 versions of the game shipped without an updated MT-32 driver causing the game to choke when attempting to load it. Use this patch and place it in the sound\ folder. Overwrite if necessary. Hackable on CE with UFO Extender. DIGPAK/MIDPAK CE instead uses dsound. ↑ 1.0 1.1 File/folder structure within this directory reflects the path(s) listed for Windows and/or Steam game data (use Wine regedit to access Windows registry paths). Games with Steam Cloud support may store data in ~/.steam/steam/userdata/<user-id>/7760/ in addition to or instead of this directory. The app ID (7760) may differ in some cases. Treat backslashes as forward slashes. See the glossary page for details. This page was last edited on 30 March 2019, at 06:24.